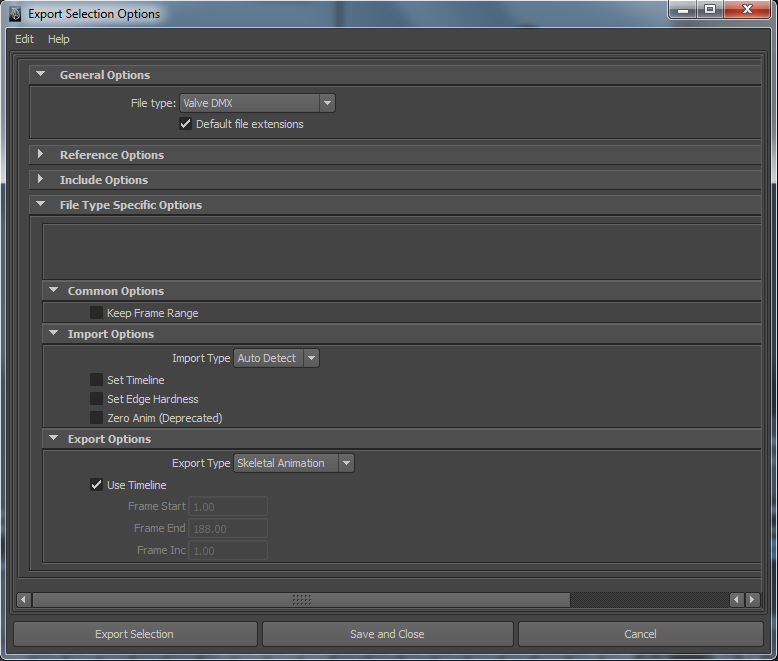 The Maya DMX Export Manager is a simple tool which can help with saving and configuring maya scenes for export and compilation into game models. It can be accessed from Valve menu, which is available if the sfmValveSetup.mel script has been sourced in Maya or if Maya was launched with runmaya.bat. If the Valve menu doesn’t show up, check the Maya script editor for possible error messages involving configuration issues. In a maya scene with meshes, select the meshes to turn into a game model and select Valve -> DMX Export Manager. If the maya scene isn’t saved in the VPROJECT content tree, the New Asset Directory Wizard will come up prompting for a model name. The Create Blank Material option will create a blank psd image file, which can then be compiled to a vmt (game material) and vtf (game texture). If you edit the psd file and compile the model, the material will also be compiled and your image edits will be available in Maya and on the game model. Once the scene is saved under the VPROJECT content tree, the Maya Export Manager will show up with an export item for your selected meshes ready to be compiled into a game model. Press Export And Compile All Items to compile your model and any assigned game materials. If there are no errors in the command shell output window, then you can click on the view button in the export item to launch hlmv to view your compiled model. There are many helpful options on the export item that you can access by right clicking anywhere in the export item itself. This page was last modified on 14 November 2013, at 08:25.